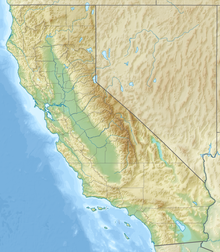 The Gabilan Range or Gabilan Mountains are a mountain range in the Southern Inner California Coast Ranges System, located in Monterey County and San Benito County of central California. Pinnacles National Park is located in the southern section of the range. The Gabilan Range trends in a northwest-southeast direction along the Monterey County and San Benito County line. It is bordered on the east by the Diablo Range, the San Andreas Fault, and State Route 25; and on the west by the Salinas Valley, Santa Lucia Range, and U.S. Route 101. Fremont Peak, at 3,455 feet (1,053 m) in elevation, is the range's highest point. There are several other peaks also over 3,000 feet (910 m) in the range. In Spanish, gavilán (gabilan is an older alternate rendering) means "sparrow hawk". Hawks, especially the red-tailed hawk, are common in the range. The Gabilan Mountains and other nearby places are mentioned in several novels by John Steinbeck, such as Of Mice and Men and East of Eden. In The Red Pony notably, the main character (Jody Tiflin) names his pony "Gabilan" after the mountain range. ^ "Gabilan Range". Geographic Names Information System. United States Geological Survey. Retrieved 2009-05-04. ^ Gudde, Edwin G. (2004). California place names: The origin and etymology of current geographical names. Berkeley and Los Angeles, California: University of California Press. p. 140. ISBN 0-520-24217-3. Wikimedia Commons has media related to Gabilan Range. This Monterey County, California-related article is a stub. You can help Wikipedia by expanding it. This San Benito County, California-related article is a stub. You can help Wikipedia by expanding it. This page was last edited on 10 June 2018, at 02:52 (UTC).